Like this post? Please “Pin It” on Pinterest! Did you know that tonic water will glow under a blacklight? We didn’t either. 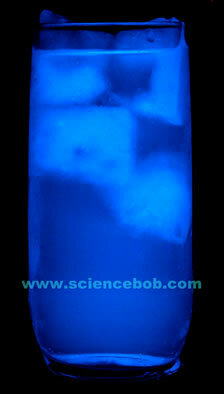 The quinine in the tonic water glows a very cool looking blue color that we really like. If you’re not crazy about the taste of tonic water, try making ice cubes using the tonic water and then add them to a glass of Sprite or another light colored citrus drink. Switch on the blacklight and you have the perfect Halloween beverage. 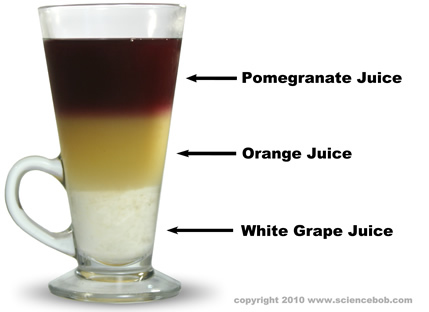 After a few minutes the entire drink will start to glow. 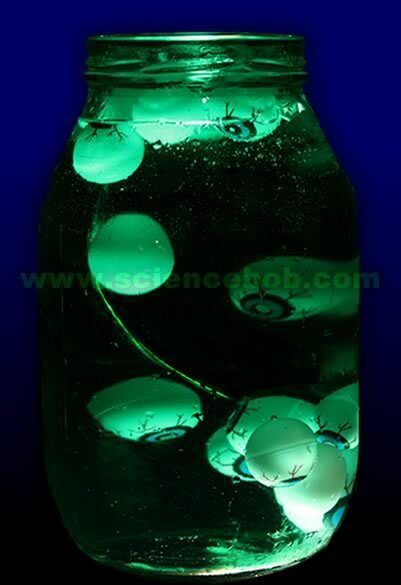 (see photo) It works for making glowing Jello as well. Slime and Halloween go together like, well, slime and Halloween. 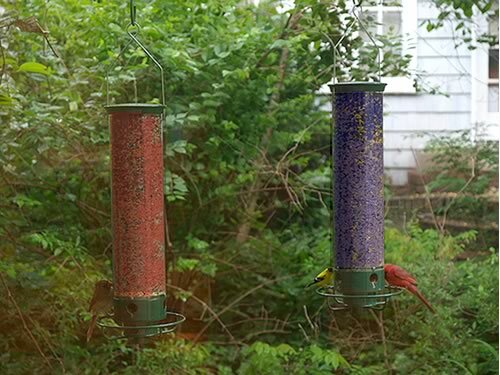 Here’s 2 ways to add a little slime to your October. 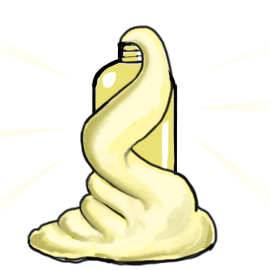 DO IT YOURSELF SLIME – If you’ve got a little glue and some powdered borax, you can mix up some slime by following the instructions HERE. 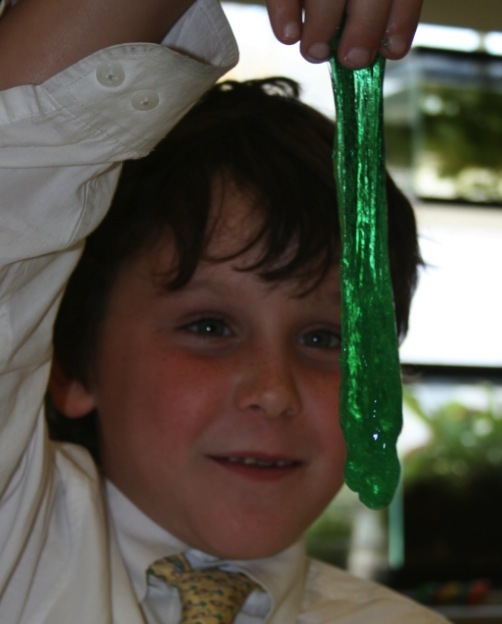 READY TO GO SLIME KITS – If you want to make LOTS of classic slime as an activity for a party or science lesson, or if you have trouble finding Borax, a kit is the way to go. You can find some great slime making kits by clicking HERE. Ghost Bubbles are regular soap bubbles filled with dry ice mist. If you know the secret you can even hold them in your hand without them popping. 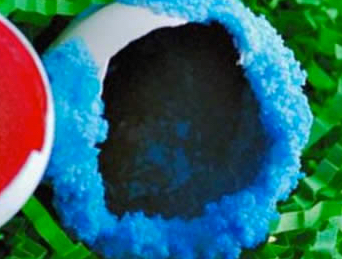 Find out how to make Ghost Bubbles by clicking HERE. 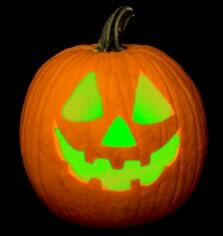 All your neighbors will have Jack-O-Lanterns that glow orange, but you will impress them with a Jack-O-Lantern that glows green! Best of all, the green glow is simple and safer than traditional candles. Purchase one or two large glowing light-sticks per pumpkin at a party store or hardware store. (We like green, but there are many colors to experiment with) Activate the light stick and simply drop them into the pumpkin, or, to conceal the glow sticks, attach them to the inside of the pumpkin lid by unbending large paperclips to secure them. Place your pumpkin outside on Halloween night and admire the “Oooos” and “Ahhhhs” of Trick-Or-Treaters. 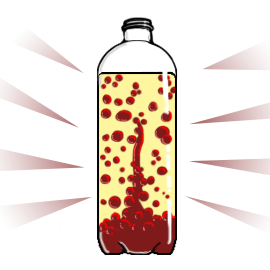 If you think haunted houses are scary, wait until to hear…haunted drinkware! First, check out our Chicken In A Cup experiment, but instead of pulling along the string in short bursts to sound like a chicken (it really does, trust us) pull in one continuous motion. The result is an eerie screaming cup! The only thing better than than trying the screaming cup yourself, is trying the screaming cup with LOTS of your friends all at once. Parents especially seem to enjoy that. The instructions can be found HERE. Every mad scientist needs some bubbling potions. While dry ice may be the ultimate bubbling potion, the effect tends to be short-lived, and dry ice can be dangerous around younger Halloween party goers. The solution is a simple aquarium pump. Purchase an inexpensive aquarium pump and some tubing at your local pet store along with a line splitter (if you want more than one bubbling potion.) Set up the pump to send bubbles into various large food jars through the tubes. Add some food coloring, plastic bugs or fake body parts, and you’ve got the sights and sounds of a mad scientists lab that will last all night. For added drama, light up the jars from below using flashlights. You can also create floating eyeballs by drawing an iris and pupil onto ping-pong balls with permanent markers. Make a few that will float around by drilling two very small holes in the ping-pong balls and allowing them to fill with water until they sink. For an added glowing black light effect add our Glow-Bright Concentrate. If you have got some dry ice around this Halloween, gather your friends and family and try making a Dry Ice Bubble Sphere. It’s easy, and the result will wow anyone at your party. Get all the instructions HERE. Make a paper ghost seem to rise at your command an even dance around. CLICK HERE for instructions to make a static powered dancing ghost. 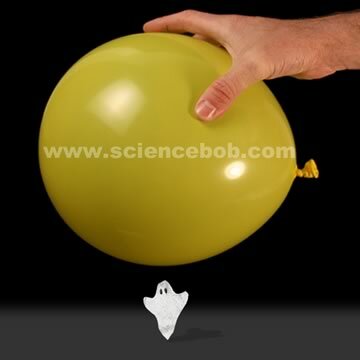 If you have some dry ice from the Ghost Bubble Sphere left over, you might want to try this fun little demonstration. 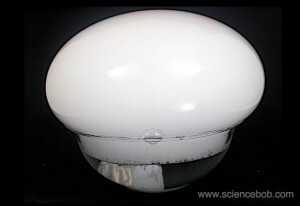 Dry ice is the solid form of carbon dioxide. As it sublimates, (turns back into a gas) the carbon dioxide gas escapes around the quarter causing the quarter to vibrate and make a rather spooky shrill along with occasional humorous sounds. 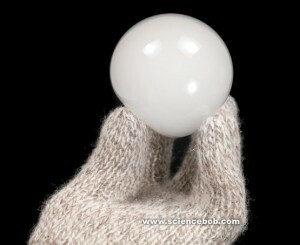 Always wear gloves when performing this demonstration. 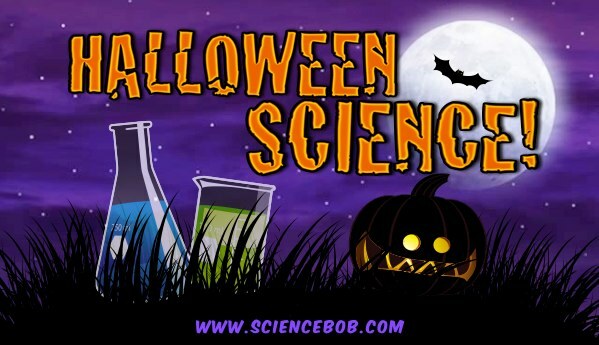 Halloween Science on Live! With Kelly & Michael. 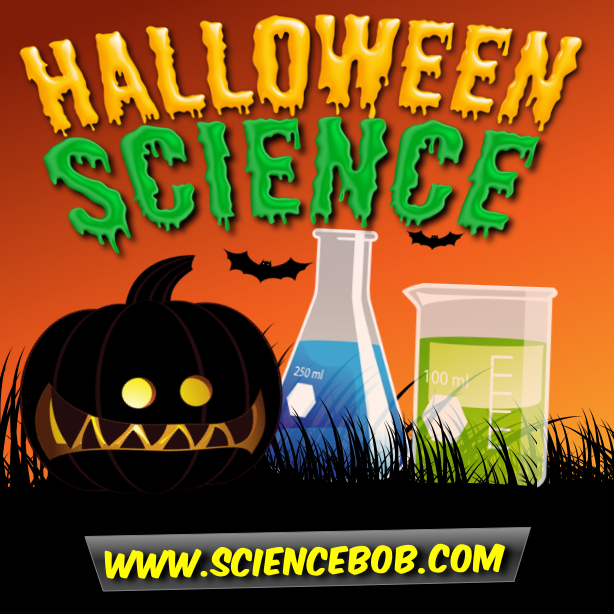 More Halloween Science on Live! With Kelly & Ryan. 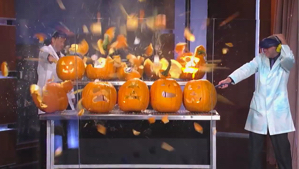 Here’s some Halloween Fun you should NOT try at home, but it’s still fun to watch! ITEMS AT OUR STORE, CLICK HERE.